It’s just too white. I like warmth and color! For those worried about keeping a white kitchen clean — I’ve had two white kitchens and it’s really no more work to keep clean than any kitchen. It’s definitely an issue of personal preference, but I have loved my white kitchens. Often that space above the cabinets is filled with purely decorative elements — which is fine — but making some of the space (or all of it, if it’s a small area) a place to organize and store odds and ends helps free up valuable lower space for the things that you need more often. Seasonal decorations, disposable dishware, extra table linens — no one will know what you have stored up there in these simple but stylish baskets! Varied texture also helps add warmth to the kitchen by using similar tones in a variety of warm, natural materials. Wood countertops, woven baskets, and linen (or muslin or burlap) fabrics work together to add a little bit of country charm to a modern white kitchen. A kitchen that is just beautiful isn’t one any of us want to cook in — we want something that is both beautiful AND useful! Add a little bit of necessary function to the kitchen with a memo board near the stove to hold recipes or other reminders, and a nicely framed whiteboard adds some family organizing without looking too much like a whiteboard. The copper storage canisters and deep metal cabinet hardware and faucet contribute to the warmth of the other textures and add a little class. Find similar copper canisters to here (or try these in brushed bronze) to add some shine to your kitchen. 5. 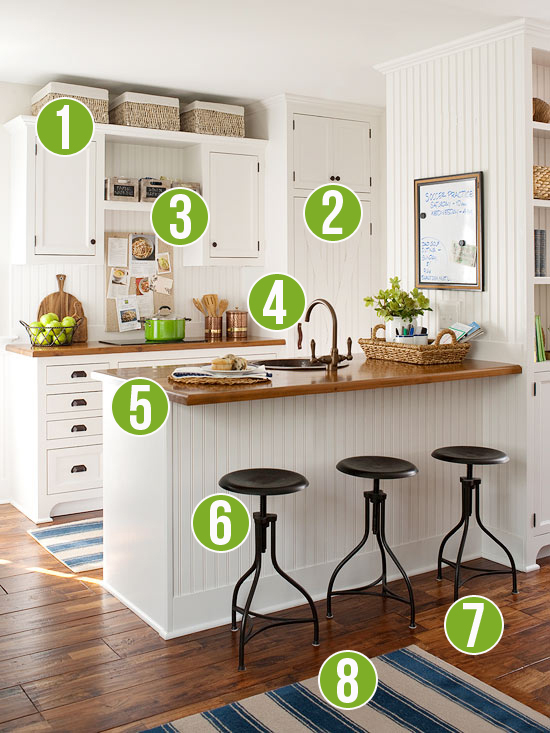 Go For Butcher Block! If you want to go full-on white country kitchen, keep your furniture to more traditional wooden styles. But if you want your kitchen to feel a little bit more modern, barstools are a great place to start! We like these vintage-inspired metal barstools from Wayfair. Wood flooring is one of my favorite ways to add both warmth and style to any room. In this kitchen, the wood floors really pull the whole look together — and the wood tones don’t have to match exactly! The different colors of wood look great together. We love our wood floors, and they are a great fit for a kitchen area because wood is durable and cleans well. See different ways you can install and restore wood floors here. Wood floors look lovely, but accenting with rugs makes the place more cozy and allows you to express your style. And a simple flour sack print like on the rugs in this kitchen is easy to DIY! You can paint a rug to add some color like I did, or you can start with a plain rug and paint it any design you want! Beth from Home Stories A to Z shows you how to paint stripes. I agree with adding natural elements. Once I added a bamboo shade to my kitchen window it immediately warmed up the room. Then, I made sure to add small touches of texture around the room. I as a little worried it would look sterile after we painted it and hadn’t decorated yet. These things made such a difference! While I love white kitchens, when we were getting ready to paint our cabinets, the white just felt too overpowering in our kitchen. We ended up using a darker ivory with a chocolate glaze to warm them up. My white cabinets are paired up with Carrara marble counters on the perimeter of our kitchen, but we used a walnut top on our island, which helps warm up the room, along with the wood floors. Keeps the white cabinets and stainless appliances feeling not so sterile. I love white kitchens. Mine is white and no regrets. Warmed up also with a dark wood floor. Always have variety as can change with seasons or holidays. Enjoyed your feature. In the first kitchen, there is no range hood. How do you keep grease from getting all over the kitchen and the house? Love the white – I never found it hard to keep clean. The only thing I would change are the stools because I like a back and a little softer! Pay attention to the washability of your whites. My own white cabinet doors are some type of shiny vinyl process — not the matte vinyl but very slick. (Not laquer either, not sure how that would wash.) I got them off the shelf from Home Depot 25 years ago, thinking we’d replace them when the budget allowed… they are still new-looking! And no, they don’t look vinyl or anything unnatural. They are SO easy to clean. I just use a dishcloth and then occasionally do a whole kitchen cabinet clean — swipe the door fronts with a blue glass cleaner type spray and an old white tee. Great tip, thanks for the reminder!